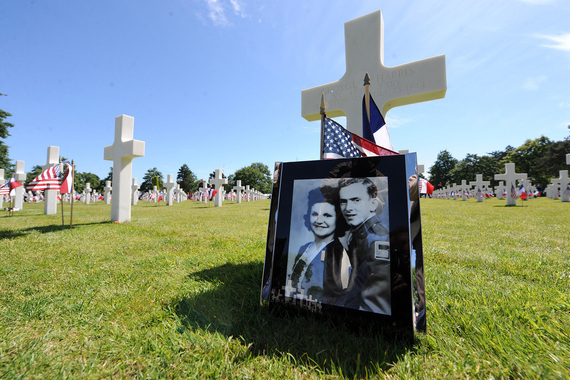 The 70th anniversary of D-Day is now history -- and what a history! But the deeds of its heroes, the images of the celebration and our reflections on that historic day linger on. As the commemorations were wrapping up "over there" -- in Europe and particularly in Normandy -- they were just getting started here at home. 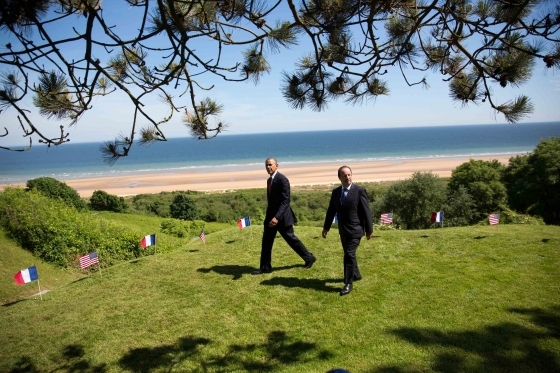 Over there, at those sacred beaches where the Allied forces made landfall seven decades ago, in the little towns where so much close combat took place and where so many died, heads of state, generals and ordinary people, including local French residents, came to pay tribute. 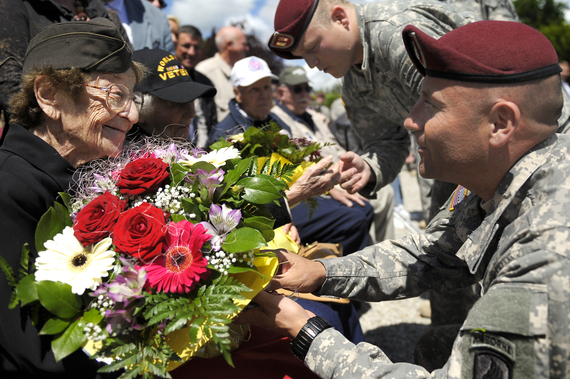 A U.S. paratrooper presents flowers to Ellan Levitsky-Orkin who served as a U.S. Army nurse in Normandy during World War II, at a ceremony honoring the service of U.S. Army nurses during World War II, in Bolleville, France. Here at home, D-Day was also remembered in towns and cities across the country. And, the French were expressing their thanks, too. I had the privilege to attend a most touching ceremony aboard the battleship USS Texas, herself and her crew participants in that epic event. Arranged and hosted by the Consulate of France in Houston, co-hosted by the Battleship Texas Foundation and supported by the city of La Porte, Texas, and by many others, the purpose of the ceremony was to award France's highest decoration, the French Legion of Honor Medal, to more than 30 U.S. Veterans from Texas, Arkansas and Oklahoma for combat action in France during World War II. The stories and actions of these brave men are inspiring. Some, like Indalesio Alcorta and Clifford Talbott waded or crawled onto the beaches of Normandy on D-Day or shortly thereafter. 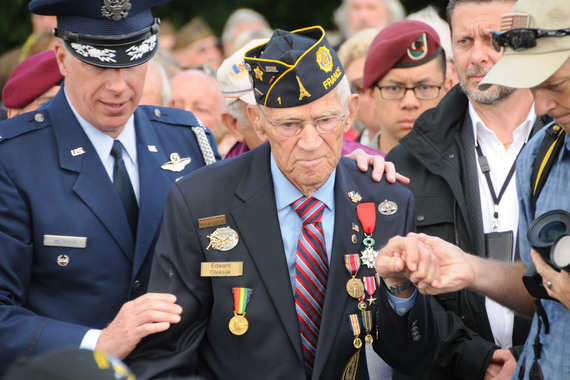 Edward Fowler (below, center), who landed in Normandy on D-Day+1, was wounded within three days, returned to duty after the shrapnel was removed, fought in the Battle of the Bulge and was later wounded again. It must have been a very special feeling for Howard Mills to receive his Legion of Honor Medal aboard the very same ship -- the USS Texas -- on which he served on D-Day. On that day, the Texas' mighty guns silenced the German guns atop Pointe du Hoc and, subsequently, attacked enemy anti-aircraft batteries near Vierville. After repairs for damage caused by German shelling near Cherbourg, Mills and his ship sailed to the Mediterranean to support the invasion of Southern France. Many of these heroes helped liberate small towns and big cities alike. Leroy Bass fought at Cherbourg; Herman Haydon helped liberate Trévières and St.Lou before he was shot in both legs in the "Battle of the Hedgerows." Milton Jackson helped liberate Rheims and other villages and cities. Clarence Kelly helped capture Brest. Then, under General Patton, he helped liberate Nancy and Metz. A few months later, Kelly was wounded after his jeep drove over a landmine. Young men such as Albert Aarlie, Grover Cunningham, Robert Hamer, Jimmy Holmes, Grover Trytten and Raul Vera fought their way across France and Europe in battles starting in Normandy and Brittany, then through the Ardennes, including the Battle of the Bulge, fighting their way through the Vosges Mountains, Alsace-Loraine, across the Rhineland and onward. After helping liberate Brest, Bill Creech went on to Czechoslovakia and even helped liberate two concentration camps. Bernard Lee also advanced to the Czech border after fighting in the Battle of the Bulge. Joseph Ostrokol and his platoon protected American tanks in Le Havre, and then fought through France, Germany and Austria in the coldest winter. Then there were the intrepid "flyboys" -- pilots, navigators, bombardiers, gunners, radio operators, etc. -- who risked their lives every mission they flew, before, on and after D-Day to pound German defenses and strategic targets. Men like pilot Leo Bielinski, who flew 23 bombing missions; aircraft commander Samuel Smith with 24 bombing missions; Edward Anderson with 30 combat missions under his belt; B-24 gunner, Harold Dietz, with 26 missions; nose turret gunner Perry Kerr who flew 11 missions, including one over Vaux-Sur-Mer. Theodore Hood flew an amazing 35 bombing missions over Europe, including one on D-Day to destroy bridges and railroads behind enemy lines. Also on D-Day, radio operator-gunner John Chopelas' aircraft bombed the coastal defenses at Caen. Chopelas went on to fly a total of 33 missions, including the first England-to-Russia mission. On one mission, a flak burst killed the tail gunner and wounded Chopelas. William Toombs, only 19 when he was assigned to the 493rd Bombing group in England, flew 28 missions over Europe, the first six in direct support of the Normandy Invasion. He managed to fly his crippled bomber safely to Brussels - - the city had been liberated just a few days earlier -- after being hit in September 1944. On his 18th mission over Europe, the aircraft Horace Shankwiller was piloting was hit. Shankwiller managed to fly the crippled aircraft back across the Channel and "safely" crash-landed it -- if there is such a thing -- on a grass strip in England, saving his entire crew. Shankwiller went on to fly nine more missions. Some of the heroes were not so fortunate. Robert Peiser, a rifleman with the 141st Infantry, was wounded by shrapnel, cut off from his battalion and captured by the Germans at Colmar. Peiser spent a rough five months as a prisoner of war (POW) and was freed in May 1945. He was awarded the Purple Heart Medal and the American Ex-POW Medal. In August 1944, William Trenary, a young paratrooper, jumped and landed in Southern France as part of "Operation Dragoon." Although injured -- hit by shrapnel -- Trenary returned to battle after recovery, fought his way through all of France to join the Battle of the Bulge, where his campaign ended after he suffered severe frostbite. Donald Lippincott saw action in France even prior to the Normandy landings. As a combat infantryman, Lippincott took part in a mission to assault, capture and close submarine facilities in the port of Brest, France. After heavy combat, Lippincott's Division was able to shut down German operations in the North Atlantic. 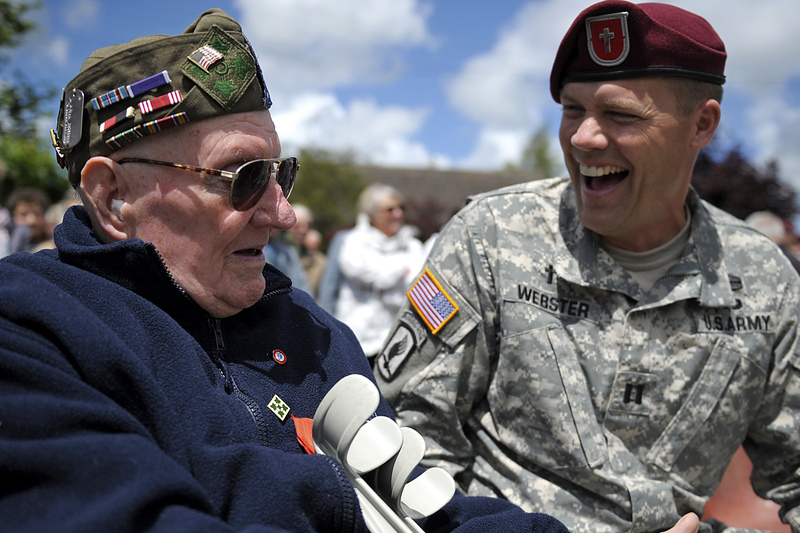 Two World War II veterans honored by France, both medics, performed life-saving roles for wounded soldiers. Arthur Firkins, Jr. landed on Omaha Beach on June 12. He followed his unit, as a Medic, as it fought its way across France and into Germany. Frank Tibbit, also a Medic, served the troops in his unit in five major campaigns and battles: Normandy, Northern France, the Ardennes, Rhineland and Central Europe. One of the most interesting and charming personalities at the ceremony was, in my opinion, Tsutomo "Tommie" Okabayashi. His daughter-in-law, Mari Okabayashi, says that his Army buddies call him affectionately "Tex" to this day. Born in Kennedy, Texas, "Tommie" joined the Army in the spring of 1943 at the age of 18. His father had just been released from an internment camp in Texas and had mixed feelings about his son joining the Army. But Okabayashi, born in Texas, felt it was his duty to serve his country. After training at Camp Shelby, Mississippi, he joined the 442nd Regimental Combat Team, a regimental-size fighting unit made up almost entirely of American soldiers of Japanese descent. These patriotic young men joined, despite the fact that -- as in Tommie's case -- many of their relatives were subject to internment. Okabayashi went on to serve with his unit in Italy and France. The 442nd's motto was "Go for Broke" and is one of the most decorated units in U.S military history. The unit is especially famous for helping rescue the "Lost Battalion." Now finally, to my good friend John Tschirhart. Born in San Antonio, Tschirhart grew up in France. In 1941, Tschirhart returned to the US where he took multiple military training courses, graduating as a B-17 bombardier. Back in Europe, he participated in 35 bombing missions and served as an Intelligence officer, gathering and relaying information in connection with the French resistance during the campaign of Normandy and the liberation of Paris. Tschirhart was awarded a European Campaign Medal with three Battle Stars, an Air Medal with three Oak Leaf Clusters and the Distinguished Flying Cross. A highly decorated World War II veteran, John went on to serve his country in many positions of responsibility in Laos, Vietnam, Libya and in the U.S. He is still, at 94, an aspiring movie producer, a "hopeless romantic" and, above all, a patriot. Just as Tschirhart is a recipient of several military decorations, the awards and decorations earned by the veterans discussed above are high and numerous and include the Air Medal, Distinguished Flying Cross, Bronze Star, Purple Heart, European Campaign Medal, etc. and many oak leaf clusters, service stars, etc. It was a unique and emotional experience to see and meet so many members of the rapidly disappearing Greatest Generation on a ship that "was there" seventy years ago, and to listen to their stories of courage and patriotism. 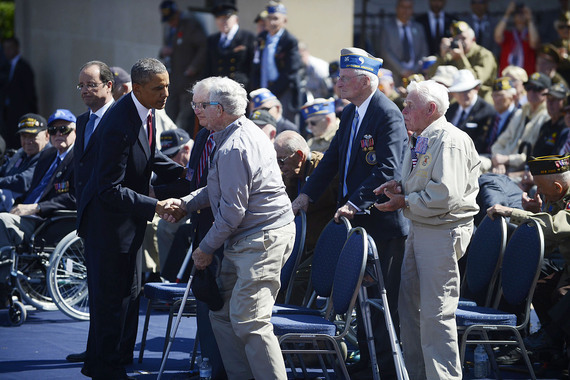 Men, who as the President said at Normandy, "were willing to lay down their lives for people they'd never met and ideals they couldn't live without." As I was leaving the Battleship Texas, I happened to see a beautiful, small dove perched on the barrel of one the battleship's anti-aircraft guns. I could not resist taking some photos. Some may see incongruity in the symbol of peace perched on a weapon of war. I view it as symbolizing "peace through strength," the same strength these veterans displayed 70 years ago, strength that defeated our enemies and brought the world some peace -- albeit fragile and fleeting.